From a position about 60 yards south of this point the battery, between 2 and 3 p.m., engaged and silenced the Confederate artillery around the Dunkard Church. Location. 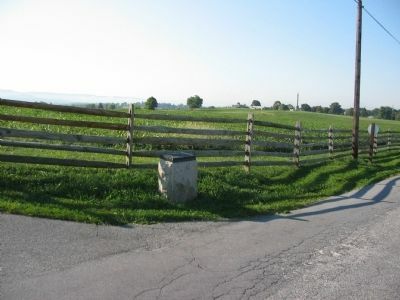 39° 28.71′ N, 77° 44.628′ W. Marker is near Sharpsburg, Maryland, in Washington County. Marker is at the intersection of Smoketown Road and Mummas Lane, on the left when traveling west on Smoketown Road. Touch for map. 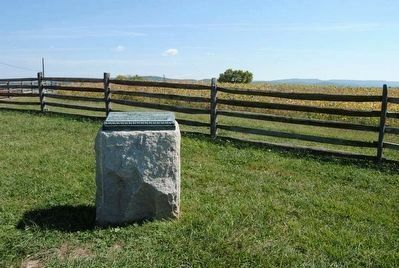 Marker is in this post office area: Sharpsburg MD 21782, United States of America. Touch for directions. The park Visitors Center is in the distant center above the monument and to the right of it is the New York State monument. (about 300 feet away, measured in a direct line); A House Was Burning (about 500 feet away); Smith's Division, Sixth Army Corps (about 500 feet away); Sixth Army Corps (about 500 feet away); First New Jersey Brigade (about 500 feet away). Touch for a list and map of all markers in Sharpsburg. 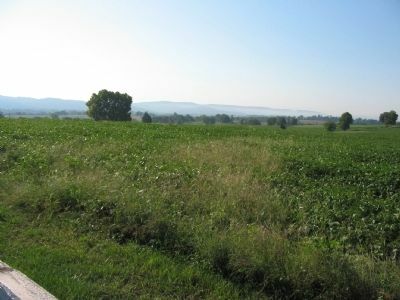 The battery occupied ground south of the monument along Mummas Lane, facing to the west (right) toward Confederate artillery positioned to the west of the Hagerstown Pike. More. 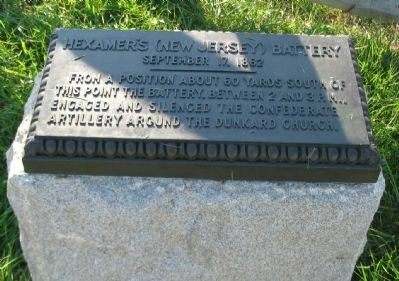 Search the internet for Hexamer's (New Jersey) Battery. Credits. This page was last revised on September 29, 2017. This page originally submitted on March 8, 2008, by Craig Swain of Leesburg, Virginia. This page has been viewed 866 times since then and 5 times this year. Photos: 1, 2. submitted on March 8, 2008, by Craig Swain of Leesburg, Virginia. 3. submitted on October 24, 2015, by Brian Scott of Anderson, South Carolina. 4. submitted on March 8, 2008, by Craig Swain of Leesburg, Virginia.